In 2012, we were contacted by the curators of the Festival International de l’Affiche et du Graphisme in Chaumont, who asked us whether we would be interested in designing a t-shirt for the NY band Sonic Youth. In short, that year’s edition of this French poster festival would revolve around the relationship between rock culture and graphic design (and would include, among other things, a major retrospective on the work of the legendary record sleeve designer Barney Bubbles). As part of the festival, the curators (Etienne Hervy and Sophie Demay) thought it would be interesting to commission us to design an official band shirt for Sonic Youth (in other words, a shirt authorized by the band). Now, to be honest, we were a bit reluctant to accept this invitation. It just felt a bit awkward. As some of the readers might know, our studio is actually named after a Sonic Youth album (‘Experimental Jet Set, Trash and No Star’ from 1994). We felt that the last thing we should do was to get close to the band who inspired the name of our studio. We simply didn’t want to come across as a bunch of stalkers, groupies or fanboys/girls. Besides, around the time we were contacted by the curators, we were already well-aware that the band went through a difficult time, and were in fact about to break up (or better said, about to go on an ‘indefinite hiatus’). The last thing we wanted to do was to bother them with some sort of art-project on the other side of the ocean – we figured they had more important things on their minds. Having said that – we also felt it would be a bit arrogant to turn down an assignment like this. If somebody would have asked us to design such a shirt twenty years ago, we would have been bursting with joy. So we figured, why not just accept the assignment as it is, and be grateful? After all, we’re not that jaded yet. So we decided to just do it. We started by taking the SY acronym, which we then set in a certain iconic typeface. We then turned this acronym on its head, making it less iconic, and less familiar, which was exactly the sort of anti-iconic gesture we were trying to make. However, we also realized the negative connotations of putting something on its head (think of the upside-down cross, the upside-down flag, the upside-down peace sign); so to negate this negative gesture, we added a handwritten speech bubble to the design, stating “Power to Sonic Youth” (in French). The band might be on its back, but they are still in power; that was more or less the message. Within the French context, we think the addition of the handwritten speech-bubble is quite significant. One immediately has to think about the whole strategy of Lettrist and Situationist ‘détournement’, and the specific way in which handwritten speech bubbles have been used in collages such as André Bertrand’s ‘La Retour de la Colonne Durutti’ (1966). Another French example of this ‘collage-like’ use of the speech bubble can be found in the work of William Klein; see for example his poster for ‘Mister Freedom’ (1969). But we have to admit that our main inspiration for the speech bubble, as we used it on the shirt, came from ‘Les Nanas au Pouvoir’, a drawing by Niki de Saint Phalle, from 1967. In short, by adding the speech bubble, we tried to refer to the French context of this project. It’s a clear nod to the legacy of typical French movements (such as the Lettrists, the Situationists, and the Nouvelle Réalistes). And of course, the fact that the upside-down letter ‘Y’ looks slightly liked the Eiffel Tower also gives it a bit of a French edge. To emphasize the ‘Nouvelle Réaliste’ theme even more, we decided to print the design in red and blue, on a white shirt. In our view, this colour combination (blue/white/red) really refers to the film titles of Godard, the dripping French flags of Gerard Fromanger, etc. We have to admit though – it took some time to convince the curators to print the shirt in these colours. As we already experienced with previous French clients (RMN, Le Cent Quatre, etc. ), the French are always quite nervous when it comes to using the colours of their flag – it is perceived as a very chauvinist thing to do. But fortunately, we managed to convince the curators to let us have our way with the colours. After all, we think blue/white/red is a colour combination that can refer both to national identity (the French flag) AND to its critique (the work of Godard, Fromanger etc.). We fully realize that the phrase ‘Les Sonic Youth’ is grammatically incorrect – it’s a strange mixture of a singular noun (‘Sonic Youth’) and a plural article (‘Les’). But it was a very deliberate attempt to emphasize the whole ‘collage-like’ character of the speech bubble. Besides, we always loved these album sleeves you sometimes come across, in French record stores: Les Who, Les Pink Floyd, Les Black Sabbath, etc. The French always have a very interesting way of folding their own language around foreign languages, literally embracing it, in an almost Pop-Art way. So we wanted to refer to this phenomenon, by boldly stating ‘LES Sonic Youth’, in all its grammatical awkwardness. 200 copies of the shirts were screenprinted, on fair-trade, certified cotton (Sol’s Bi-Ethic). The shirts were sold (as ‘rock merchandise’, so to speak) during the Chaumont Poster Festival (taking place between May 26 and June 10, 2012). 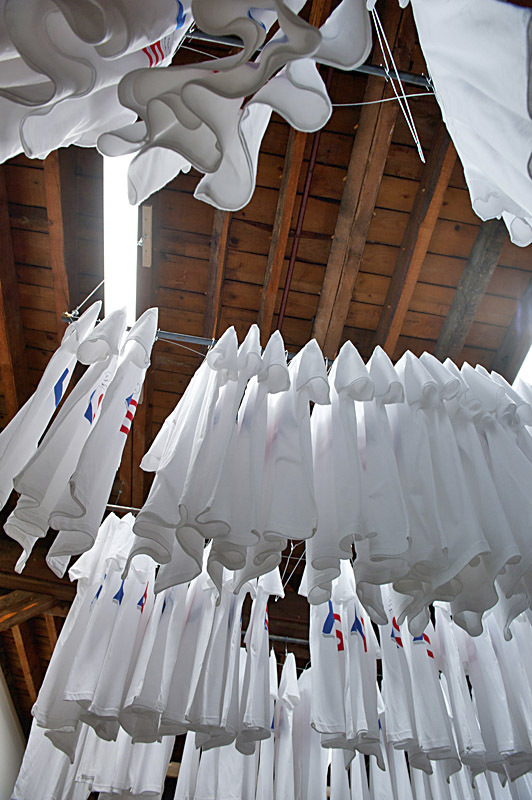 We weren’t actually present during the festival (we were in NYC around that time), but as we understood, the curators built a sort of installation around the shirts, displaying them on metal racks (we weren’t responsible for this installation though). Thanks to Sophie Demay, Etienne Hervy and Kim Gordon.